Home » News » Grab your paintbrush! 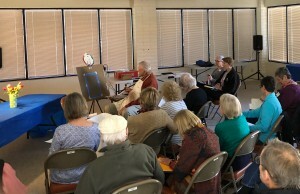 Artist and HOA resident, Fred Wackerle’s recent workshop was so well received that he has offered to host four introductory classes. They will be held at the clubhouse from 12:30 PM – 3 PM. The cost will be $30 per class to cover the cost of supplies. *The subject matter will be different for each class. All materials will be provided, including table easels but participants will need to bring their own smock or apron. Class size will be limited to 8 participants. Fred will introduce basic painting principles with a brief demonstration; participants will spend most of the class working on their own project. Fred is an experienced teacher for artists of all levels, including beginners. Discover your creative side and have some fun!